This is an Open Access article, distributed under the terms of the Creative Commons Attribution (CC-BY) license (http://creativecommons.org/licenses/by/4.0/), which permits unrestricted re-use, distribution, and reproduction in any medium, provided the original work is properly cited. 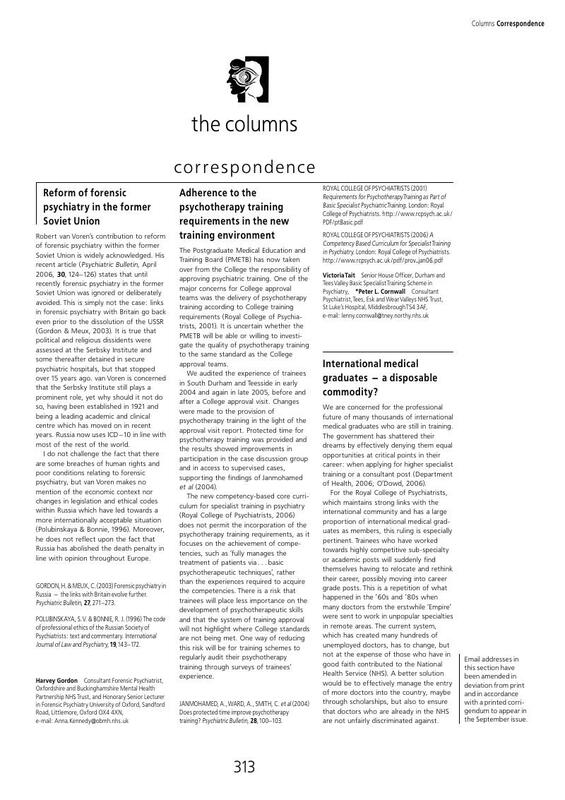 Gordon, H. & Meux, C. (2003) Forensic psychiatry in Russia – the links with Britain evolve further. Psychiatric Bulletin, 27, 271–273. Polubinskaya, S.V. & Bonnie, R. J. (1996) The code of professional ethics of the Russian Society of Psychiatrists: text and commentary. International Journal of Law and Psychiatry, 19, 143–172. Title * Please enter a title for your response. Your email address will be used in order to notify you when your comment has been reviewed by the moderator and in case the author(s) of the article or the moderator need to contact you directly. Occupation Please enter your occupation. Affiliation Please enter any affiliation. Please list any fees and grants from, employment by, consultancy for, shared ownership in or any close relationship with, at any time over the preceding 36 months, any organisation whose interests may be affected by the publication of the response. Please also list any non-financial associations or interests (personal, professional, political, institutional, religious or other) that a reasonable reader would want to know about in relation to the submitted work. This pertains to all the authors of the piece, their spouses or partners. Please enter details of the conflict of interest or select 'No'. Please confirm you agree that your details will be displayed.